The Village of Stony Run is a sleepy little town nestled in Berks County's rolling hills and farmland. Dating back to Revolutionary times; Wessnersville, which was renamed to Stony Run in 1869 because the post office kept confusing the mail with Wernersville, was the largest and busiest village in the area at the time. It was an established juncture of the old stage route, "Die Rote Schtrosse", The Red Street, from Allentown and the old "Allemaengel Road". The bulk of the village was laid out in 1815 and named after Samuel and Nathan Wessner who developed the town. The Wessnersville Hotel was established in 1856 by Samuel and Nathan Wessner. When Samuel got in trouble with the law he moved to Schuylkill Haven, PA and the hotel was sold to Jacob Shuler and David Miller. In 1877 Jeremiah Kunkel bought the Hotel and renamed it the Stony Run Hotel, because the name of the town had changed from Wessnersville to Stony Run by this time. When he was ready to retire he sold it to his daughter Montana and his son-in-law Willian F Snyder. Four generations of Kunkels owned and operated the hotel for a total of 122 years. The Stony Run Hotel was an important community center from its founding. Cattle auctions, lodge meetings and live bands where just some of the community events that took place. Horse races were also common. The participants would start at the Lehigh County line and Race about a mile down Red Road ending up at the Hotel. Live music was woven into the fabric of daily life in Stony Run from the beginning. In the Spring and Summer bands such as the Ringgold Band from Reading would play afternoon and evening concerts. The John Philip Sousa Band even played here once in the late 1920s. Prohibition didn't shut down liquor sales at the Stony Run Hotel. In fact, the Hotel thrived during that period, becoming a place for the local priests and the State Police to get their whiskey. We have a full bar with a nice single malt Scotch collection and draft beer. Currently on draft we have Paulaner Oktoberfest, Weyerbacher Imperial Pumpkin Ale, Warsteiner Dunkel, Bass Ale, Yuengling Lager, and Yuengling Premium Light. Our lovely Strawberry Room seats up to 20 people and can be reserved for private events. 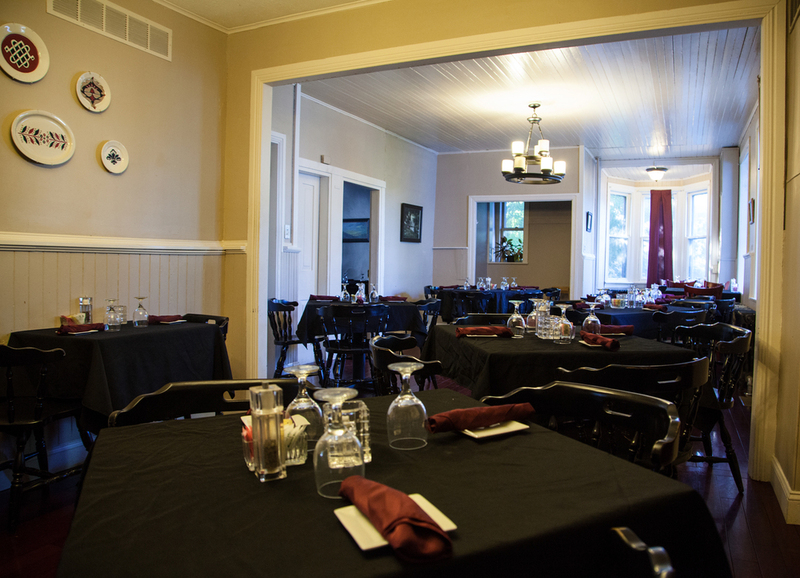 Our cozy main dining room fills up quickly, so reservations are recommended.